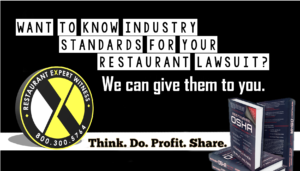 Need hard facts about your restaurant industry lawsuit? You won’t find ’em in a fortune cookie. You’ll find them in our Howard Cannon’s book, Restaurant OSHA Safety and Security. Thousands of hours of legal research, right at your fingertips. To find out more about Howard Cannon’s book or to purchase a copy, CLICK HERE. To find out more about Restaurant Expert Witness and Mr. Cannon’s services, CLICK HERE.